Keep your dog busy with these boredom busters! My dog looks up to me a lot. So, it always makes me feel guilty whenever she sprawls out on the floor with a thud, gives a big sigh, and then stares me down with those sad, bored puppy eyes. All she wants to do is play! Maybe I’m overthinking it, but she would get up in a heartbeat if she saw me with a toy in hand! So, how do you cure dog boredom? Dogs need a lot of physical exercise, mental stimulation, and social interaction. Otherwise, they will look for something to take their frustration and boredom out on, such as chewing up your living room couch, digging out all your new outdoor plants, or barking at anything with legs. Our dogs have become lazy, or rather we have allowed them to become lazy. Dogs used to work a lot! Many were bred to retrieve prey or herd livestock alongside their humans. All dogs have a natural instinct for scavenging for food. We simply need to do more with our dogs and give them (and yourself) an active lifestyle! I’m always looking for a fresh way to keep my dog busy and avoid destructive behavior in dogs. Here are some quick tips to keep your dog entertained, happy, active, and challenged. ~As they say, a tired dog is a happy dog. Walk Somewhere New: Like humans, dogs love a little variety and challenge in their walks or hike. Take them somewhere that has new scents, sounds, and experiences. Go Out On Errands: Dogs love the car ride too. If you can’t walk, take your dog along with you when you run errands! Crack open the window and let them sniff something new in the air! Never leave your dog in the car if it is too hot outside! Not only will another dog owner give you the stare down, but worse, your dog may have get heatstroke or sustain brain damage. Sign up for a Pawtivity or Event: Find new ideas to keep your dog active and happy on Pawtivity! Sign up to do something with your dog! Try a new activity you’ve never done before. We love fetch, disc dog / frisbee, and tug. Agility is also a great form of mental and physical exercise that boosts your dog’s confidence and makes them more obedient all-around – it truly is an overlooked form of play for dogs! 15 minutes of disc, agility, or other form of active play at a time truly does wonders – keep your dog wanting to do more and looking to you to play more. Go To The Dog Park: The dog park is a great way for your dog to socialize with other dogs. Better yet, it’s often free! Make Your Dog Work For Food: Since dogs used to scavenge for food, why not scatter your dog’s food in the yard and make them find their food? Or lay out small piles of food around the house for them to find. Every time you feed your dog or take your dog on a walk, make them do puppy situps (sit, down, sit, come/touch, look). Practice puppy situps at a farther distance each time. This is great training for better recall and obedience, useful for when your your dog is off leash. Get a Chew Toy: Dogs love to chew, so get a good assortment of soft and hard chew toys to try out! Carmella can bite through black Kongs, so we love edible dental bones and antler bones. Antler bones last a long time and do double-duty to fight boredom and clean teeth. Note of caution: Find the best chew toy for your dog – start with a soft one. Antler bones should be taken away if you see chipping or breakage. Chew toys that are too hard can fracture your dog’s teeth. We never had a problem with antler bones, but this has to do with they way Carmella works at the bone, she doesn’t just bite down. Tennis balls are not the best chew toys as they can wear down your dog’s teeth enamel and fall apart in pieces large enough to get stuck in your dog’s throat. In all, supervise your dog with their chew toy before deciding which one is best for them. Invest in Treat Dispensing and Smart Toys: Dogs naturally have a keen sense of smell. Why not challenge them to use their natural instincts by giving them a puzzle for them to solve? Treat dispensing and smart toys often involve the use of treats and require supervision. They also come in varying levels of difficulty. Create Distractions When You are Away: Keep a safe treat dispensing toy around, put on the tv or radio, and keep a chew toy or two around for your dog to play with when you are out. You can also try giving them frozen treats that will melt over time or put toys in a huge ice mold to leave outside. Rotate Your Dog’s Toys: This shakes things up a bit and gives more mileage to your dog toys. Dog are like kids – they love the new toy and all want the new toy. Attend a Basic Dog Training Class: How will your dog know what you want them to do? Dog owners need the proper training to communicate effectively with their canine companions. Basic commands such as sit, stay, leave it, give, or come serve as building blocks to help you play more with your dog. What are other ways that you can keep a dog busy? We hate to see a dog that is bored. Include a comment below or email us and we will add your suggestion as a pawtivity! Is Your Dog An Amazing Pup? Is your dog amazing? Contact us to be considered as one of Pawtivity’s featured amazing pups! We may feature you on Pawtivity.com or on our instagram accounts @pawtivity and @myamazingpup. Send us a photo of your dog and tell us why they are so amazing! 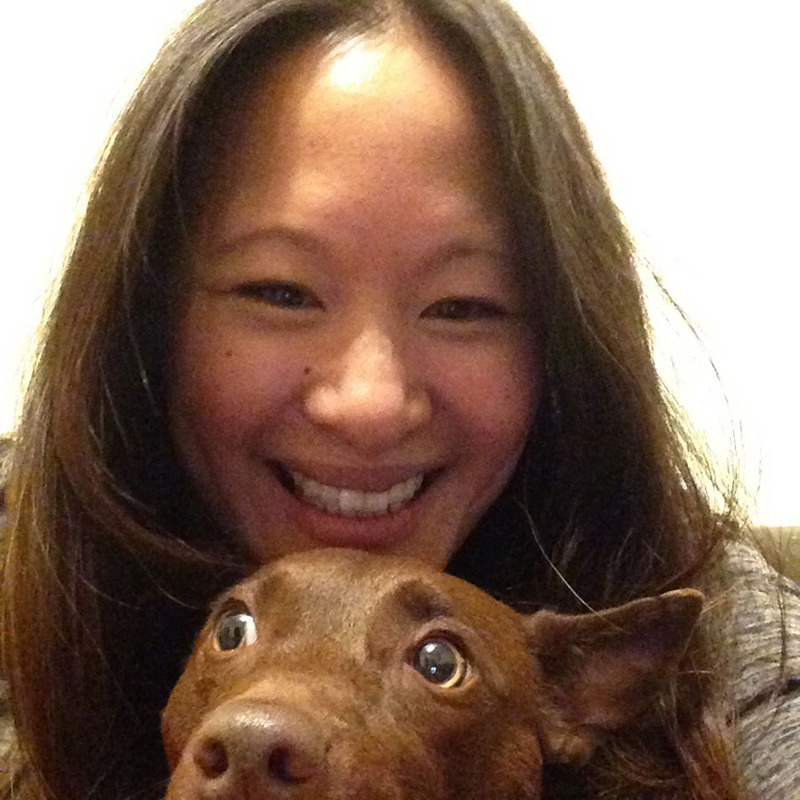 Carol Chi and Carmella have been a dynamic duo since 2012. Carmella loves to play and sure challenges her owner to do do more adventures together!